UFC featherweight champion Conor McGregor suffered a shock defeat as Nate Diaz won their welterweight fight in Las Vegas. American Diaz, 30, forced the Irishman to submit in the second round - his first defeat since 2010. McGregor, 27, said: "I'll face it like a man, like a champion. I'll come back and do it again." In another surprise, women's bantamweight champion Holly Holm lost in the fifth round to Miesha Tate. Holm, 34, stunned the mixed martial arts world by knocking out the previously undefeated Ronda Rousey to take the title in November. But the former boxer, who had won all 10 of her previous UFC fights, was choked unconscious by fellow American Tate, 29. "She went out like a champion," said Tate, who has won her past five bouts. "I have so much respect for this woman." McGregor, meanwhile, had been denied the chance to become the first UFC fighter to hold two world titles at the same time when Brazilian Rafael dos Anjos pulled out of a fight because of injury last month. The Irishman landed heavy shots in round one, opening up a cut over Diaz's right eye. He tried to finish the contest, only for Diaz to catch him with a punch in the second round after which he never regained the initiative. 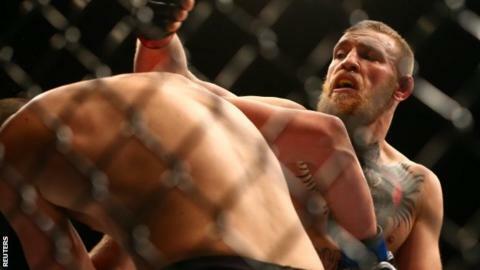 Diaz eventually got behind McGregor to apply a choke hold that forced him to submit. McGregor said: "I'm humble in victory or defeat. I took a chance to move up a weight and it didn't work. "I have a lot of respect for Nate. He came in at short notice. He was efficient. I was not."